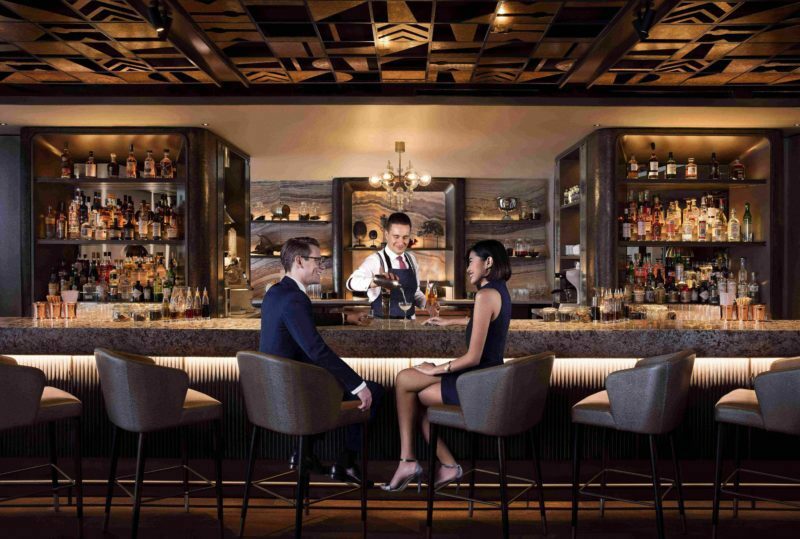 October 5, 2018 – Mandarin Oriental, Singapore has unveiled its new bar concept – MO BAR, a chic new addition to Singapore’s dynamic bar scene. Blueplate Studios by Wilson Associates has overseen the design, which has been inspired by the Pacific Ocean. The sophisticated décor incorporates travel artifacts, hand-carved wooden sculptures, etched metal panels, and hand-woven tapestries. A distinctive bar counter takes center stage and offers guests a front row seat from which to view the skilled mixology team in action. The drinks menu has been created by Bar Manager Michele Mariotti, who has worked at many of Europe’s most esteemed bars. There are 14 cocktails available including ‘Coconut Beaches of Fiji’ with pisco, lychee cordial and carbonated coconut cream and ‘Mother of Dragons’ with strawberry aloe vera, red dragon fruit juice, and cachaça. The list also includes mocktails, beers and wines, and a one-of-a-kind MO BAR Pilsner, developed in collaboration with local craft brewery, Archipelago. Gourmet light bite highlights comprise ‘Indo-China Prawns with Masala Mayo’, ‘Singdog with Achar’ and the exquisite ‘Avocado’ dessert filled with avocado mousse and Gula Melaka ice cream. The hotel’s popular afternoon tea is also served daily, featuring artisan pastries and a myriad of accompanying local delights, with the personalized service for which Mandarin Oriental is renowned. “We are very pleased to be collaborating with the talented Proof & Company team, and look forward to welcoming discerning Singapore residents, and international guests to our chic and vibrant new space.” said Christian Hassing, General Manager of Mandarin Oriental, Singapore. Two sittings for Afternoon Tea for Saturday, Sunday and Public Holidays: 12.30 to 2.30pm and 3 to 5pm. Disclaimer: The Daily Brunch does not hold the rights to the images. The Daily Brunch does not endorse alcoholism or encourage drinking in any way. Previous articleHow Long Does It Take For Food To Spoil?